The keys to your next home await at this exquisite 4 BR/2.5 Bath home with astounding river views. Designed by a Chicago architect, this home was masterfully thought out with clean lines, abundant windows and timeless details. 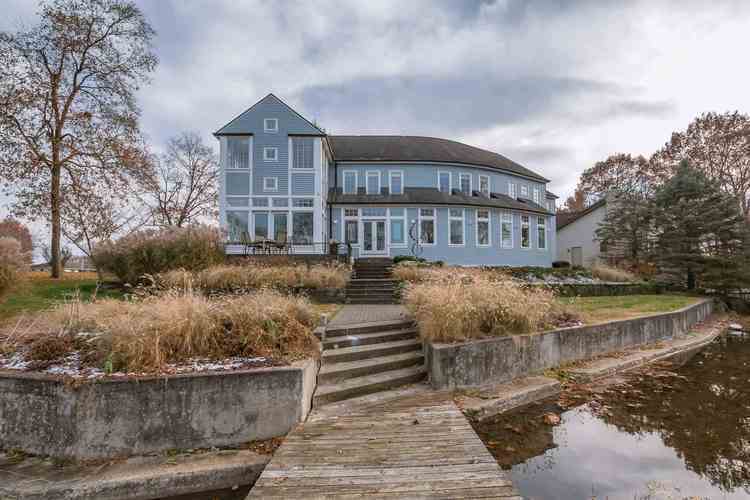 Upon arrival you will be wowed by the home's unique design, situated on a double river lot. Entering you will be delighted by all of the natural light, stunning views and hardwood floors. Custom built-ins throughout the home are an added bonus. The living room will be sure to impress with the fireplace surrounded with Italian limestone and vaulted ceilings. The kitchen is sleek, with top end appliances and will be sure to become a favorite spot for family and entertaining. Easily serving the large formal dining room, you will not want for space. Unique curved hallway moves you effortlessly to the main floor laundry and half bath all while showcasing the scenery. Upper level features a loft with fireplace overlooking the living area, providing the ideal office. Master Suite is spacious and has a beautiful attached area currently used as an exercise room. Master bath boasts heated tile floors and beautiful oversized shower. The additional 3 bedrooms offer plenty of space and privacy for family and guests alike. The lower level features a dance studio, with plenty of room for a family room, etc. Outside water activities abound, with access right from the pier. You will be sure to enjoy the delightful display of nature and wildlife throughout the seasons! This home offers endless possibilities. Call for your private showing today to see how this home will be the key to your next move! Directions:Lincolnway East to Vistula turn on North Oakley towards the river. Left on S Shore.